We’d love your help. Let us know what’s wrong with this preview of Tree Ring Circus by Adam Rex. In a quiet little lea, several miles out of town, a tree grows. It becomes home to sparrows, chipmunks, a whopping big bee . . . a runaway clown? Two poodles? An ape? Wait a minute. . . . In his quirky but realistic style, Rex creates the greatest show on earth--or at least, in a tree. The surprising text is part word game, part counting game, and part mystery. The illustra In a quiet little lea, several miles out of town, a tree grows. It becomes home to sparrows, chipmunks, a whopping big bee . . . a runaway clown? Two poodles? An ape? Wait a minute. . . . In his quirky but realistic style, Rex creates the greatest show on earth--or at least, in a tree. The surprising text is part word game, part counting game, and part mystery. The illustrations are pure, beautiful mayhem, loaded with boisterous energy and cunning little critters that readers will love to chase through the pages. To ask other readers questions about Tree Ring Circus, please sign up. A fast growing tree three miles out of town attracts all kinds of animals. There's 3 chipmunks, 2 sparrows and a whopping big bee. A chicken, 2 blue jays, a clown. Five mice and raven. And it goes on and on. The circus shows up looking for its clown, but two mischief-making apes let all of the animals out and the circus men run away. But what will happen when the elephant tries to get in the already crowded tree? I'm a little conflicted on this. I loved, loved the illustrations (well, except for A fast growing tree three miles out of town attracts all kinds of animals. There's 3 chipmunks, 2 sparrows and a whopping big bee. A chicken, 2 blue jays, a clown. Five mice and raven. And it goes on and on. The circus shows up looking for its clown, but two mischief-making apes let all of the animals out and the circus men run away. But what will happen when the elephant tries to get in the already crowded tree? Summary: A seed grows into a tree three miles out of town and animals slowly climb up to live in it. 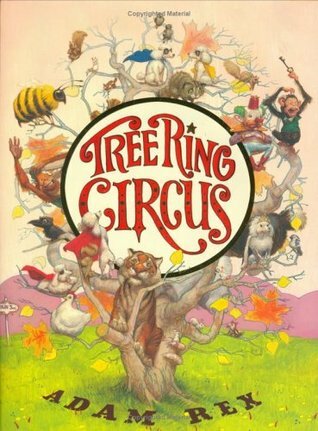 A traveling circus stops by and the animals escape to get in the tree until the elephant climbs to the top and crushes it. Then the animals get up off the ground where the tree fell down, three miles out of town. Evaluation: This book is all about the illustration. The words are even illustrated to look like circus titles and headlines and they make the book comical and jovial. There are lots of c Summary: A seed grows into a tree three miles out of town and animals slowly climb up to live in it. A traveling circus stops by and the animals escape to get in the tree until the elephant climbs to the top and crushes it. Then the animals get up off the ground where the tree fell down, three miles out of town. Evaluation: This book is all about the illustration. The words are even illustrated to look like circus titles and headlines and they make the book comical and jovial. There are lots of colors and a ton of detail, with the numerous animals that are in the tree, and it makes the book very like a visual circus. I loved it. This is a very busy book! There's lots going on in the tree located three miles outside town. Fun story. The illustrations are a little messy and crowded, but the rhythmic text is nice and there's lots of repetition to keep a read-aloud audience interested. This book had me from it's pseudo-circus poster with a booking by "reinforced binding". I have read Adam Rex before (chapter book) but had no clue what a talented illustrator he is! This is his very first book and it is lovely. My 11yo son and I both really enjoyed the rich illustrations in this book, but my 6yo son pronounced it "boring." The description pegs it as part counting game, and perhaps some we could have played that up somewhat while reading, but that angle probably appeals more to younger children (e.g. preschoolers). I do like how some of the characters are also seen in Pssst! The fantastic oil and mixed media illustrations in this book help rescue the faltering rhythm of the text. Younger children will likely find the imagery humorous and fun, plus there is an opportunity to practice counting exercises as animals are added to the tree. There's not much meat to the story however, and older children may lose interest quickly. That being said, this would be an excellent book to introduce mixed media artwork at home or in the classroom. This more than just a story of a tree. It is also the story of “3 Chipmunks, 2 Sparrows, and a Whopping Big Bee”… to start with. Adam Rex's story is simple – A tree grows, a lot of things sit in it until… I won’t ruin it for you. Needless to say the story is just okay, but the illustrations are odd and whimsical and I loved them. I absolutely love his artwork. This is a good counting book for storytime, with good illustrations and lots of animals that kids love. Since the illustrations are a little too "busy" at times, it might be less appropriate for toddlers, but keeping their attention on counting the animals might be the glue that holds their attention. 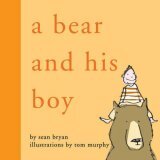 This was Adam Rex's very first book. It has a lot going for it to entice young readers, it's funny, it rhymes, there is counting, and the illustrations are lush and colorful. My favorite part of this book is actually the title page, I love his subtle humor and how he makes each of his books unique. Same premise as Stuck by Oliver Jeffers, but the execution of this picture book (which was published earlier) is superior. While whimsical, both the rolling text and the quirky but masterful illustrations flow logically and reach a satisfactory conclusion. Young children can also practice their counting and search-and-find skills. Simple story about circus animals (and others too!) in a tree. Children can count along up to 33 and help remember the animals already up in the tree. Might work as a felt story, but the illustrations in the original are quite nice, especially the circus-like typography. Rex's lettering and illustrations are playful and childlike but I can't imagine that this particular book would be easy for a child to follow especially since the text shifts in size and direction so frequently. I loved this book as an adult but wouldn't recommend it to children learning to read. I don't like circuses so that is probably biasing me against this book but for my little one's sake, I gave it a try. The only reason I gave it two stars is for the artwork. If you're going to read this aloud, make sure you prep first. The layout and design of the text is not easy to scan, although it fits with the story and illustrations. Whimsical and silly, this might be a good fit for kids who like to seek-and-find or count. Adam Rex's first children's book is simple, yet vibrant and funny. A tree grows in a field and is soon populated by 33 animals (including a clown) until it all comes toppling down. Loved the drawings and really unique style of word art! Story was a little random, though I guess that's not the most important thing to kids! This was a cute book with very busy pages that it was hard to turn the pages without at least one kid trying to keep me from doing it. A fantastically illustrated nonsensical read. Just another reason to love Adam Rex. There was a TON going on in this book! Comical and classy in text and art. There aren't many kids' books I'd pay $20 for, but this is one. Superb entertainment, bravo! The story was quirky, the illustrations were amusing and the counting text was fun. They're all in a tree! My favorite was A Whopping Big Bee. Adam Rex grew up in Phoenix, Arizona, the middle of three children. He was neither the smart one (older brother) or the cute one (younger sister), but he was the one who could draw. He took a lot of art classes as a kid, trying to learn to draw better, and started painting when he was 11. And later in life he was drawn down to Tucson in order to hone his skills, get a BFA from the University of Ar Adam Rex grew up in Phoenix, Arizona, the middle of three children. He was neither the smart one (older brother) or the cute one (younger sister), but he was the one who could draw. He took a lot of art classes as a kid, trying to learn to draw better, and started painting when he was 11. And later in life he was drawn down to Tucson in order to hone his skills, get a BFA from the University of Arizona, and meet his physicist wife Marie (who is both the smart and cute one). Adam is nearsighted, bad at all sports, learning to play the theremin, and usually in need of a shave. He can carry a tune, if you don't mind the tune getting dropped and stepped on occasionally. He never remembers anyone's name until he's heard it at least three times. He likes animals, spacemen, Mexican food, Ethiopian food, monsters, puppets, comic books, 19th century art, skeletons, bugs, and robots.